Staff and students of the School of Ukrainian Studies, 1972-73. Photo by Dr. Peter Oryshkewych. Oryshkewych, Peter. 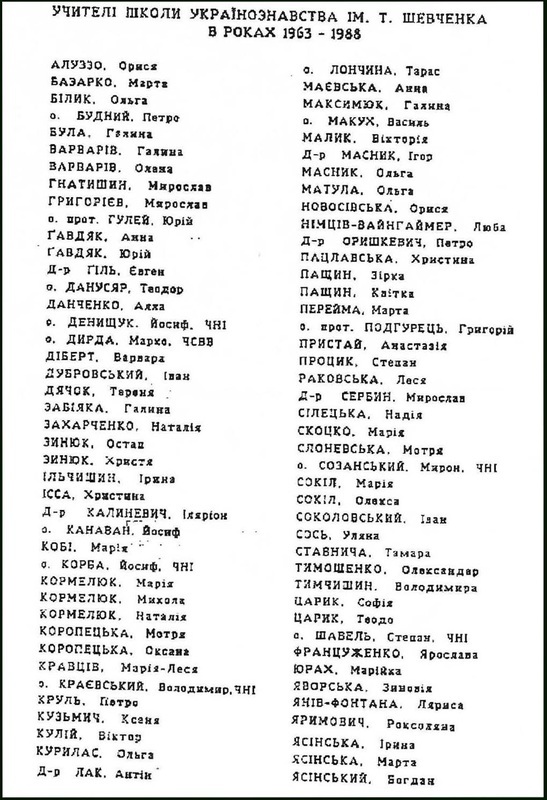 "Schools in the Ukrainian Community of Washington, D.C." The Ukrainians of Maryland. Eds. Stephen Basarab, Paul Fenchak, Wolodymyr C. Sushko and others. Baltimore, MD: Ukrainian Educational Association of MD, Inc., 1986. 310-313. Print. "The establishment of a Ukrainian school in Washington, D.C., dates back to 1950. In September of that year, the first effort was made in forming such a school at the home of Theodosius Diachok at 926 Sheppard Street, N.W. The school was known as Ridna Shkola (Native School). Fourteen children attended school during that year. The teachers were Theodosia Kichorowsky, Josaphat Pachowsky, Emilia Procinsky, and Stephania Diachok. In 1952, the school relocated to the parish house of the Holy Family Ukrainian Catholic Church at 3419 12th Street N.E., where pastor Monsignor Wolodymyr Pylypec held Ukrainian language classes every Tuesday from 7:30 to 9:00 in the evening. In 1954, a Parents' School Committee was formed, with Emilia Procinsky as its chairwoman. "After the departure of Father Pylypec in 1955, the school continued to be associated with the Holy Family Catholic Parish. Between 1957 and 1965 the supervision of the instructional program was in the hands of Professor Wolodymyr Wowchko-Kulchycky. Additional staff members included Father Theodosius Danusiar who became pastor of Holy Family Church in 1956, and Dr. Peter Oryshkewych, Myroslawa Zalucky, Ostap Zyniuk, and Iryna Stawnychy. The classes were held on Saturday mornings. Dr. Wasyl Siokalo was the chairman of the new Parents' School Committee. Subjects taught were catechism, the Ukrainian Byzantine rite, and Ukrainian language, history, and geography. In addition to these subjects, a children's rhythmic ensemble was started in 1957 under the direction of Father T. Danusiar, assisted by Olha Sushko-Nakonechny, who also directed a choir composed of students attending the Ukrainian school. "To make the Ukrainian heritage studies available to the whole community - Catholics and Orthodox - the Ukrainian Association of Washington, D.C., organized a new school in 1963 which replaced the former church school. This effort represented the spirit and purpose for which this organization was created in 1950, namely, to unite the work of both Ukrainian Catholics and Orthodox to strengthen the Ukrainian community of Washington and its suburbs. The school became known as the School of Ukrainian Studies. It found wide support among Ukrainians. "Dr. Peter Oryshkewych, who became principal, supervised the school for 11 years. In addition to Dr. Oryshkewych, the teaching staff included Anastasia Prystay, Halyna Warwariw and Maria Kobi. Three classes were conducted during the first year. The classes were initially held at St. Andrew's Ukrainian Orthodox Church located at 4812 16th Street, N.W. In 1967 the school was relocated to Forest Grove Elementary School of the Montgomery County Public School System in Silver Spring, Maryland. From the initial three classes of 1963, the school was expanded to include kindergarten, regular grades 1 through 11 and a class for English-speaking children. A total of 112 students were enrolled during the 1972-73 school year. The teaching staff in the same year consisted of fifteen teachers, including priests from both Ukrainian Catholic and Orthodox parishes. Instructors were Bohdan Yasinsky, Olha Kurylas, Petro Krul, Reverend Stephen Shawel CSSR, Dr. Peter Oryshkewych, Reverend Petro Budny, Warwara Dibert, Olha Masnyk, Iryna Yasinsky, Yaroslawa Francuzhenko, Natalka Zacharchenko, Halya Bula, Uljana Sosj, and Dr. Myroslaw Serbyn. In 1974, Dr. Peter Oryshkewych stepped down as the school principal. His duties were assumed by Bohdan Yasinsky. "A special achievement of the School of Ukrainian Studies was the accreditation for out-of-school program in Ukrainian, which was granted to this school in 1973 by the Montgomery County Public School System. This accreditation applies to students who are enrolled in Grades 9, 10, 11, or 12 in Montgomery County Public Schools. Credit earned at the Ukrainian School is honored as foreign language elective credit toward graduation from high school. Several considerations led to this decision, as Richard E. Wagner of the Montgomery Public Schools informed Dr. Peter Oryshkewych of the Ukrainian School: "... First, the emphasis of the Ukrainian school is largely on language as a medium of instruction in grammar, literature, history, and geography, and as such is comparable to the approach we are offering in our advanced language program in the larger high schools of Montgomery County. In addition, the visit of one of our staff members to your program makes it clear that the school is well organized and the students evidence a real seriousness of purpose in the program. The Ukrainian School schedule meets the requirements of the Maryland State Board of Education in reference to clock hours of instruction as related to credit..."
"The Montgomery County School System was soon followed by the Howard and Prince George's Counties which also granted a similar credit arrangement to those students of the School of Ukrainian Studies who were enrolled in their respective county schools. Thus, the Ukrainian School in Montgomery County became the first Slavic school in Maryland where students received credit for studying a Slavic language - Ukrainian. Previously, programs for earning language credit existed only for the study of Hebrew and Greek in Maryland." 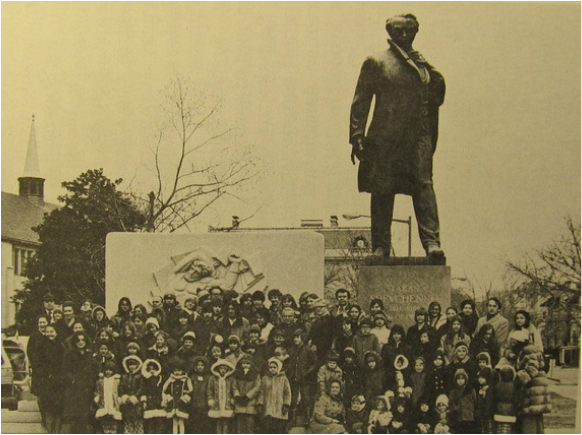 paying tribute at the Taras Shevchenko monument in Washington D.C., in 1975.